There has been a few changes this week. 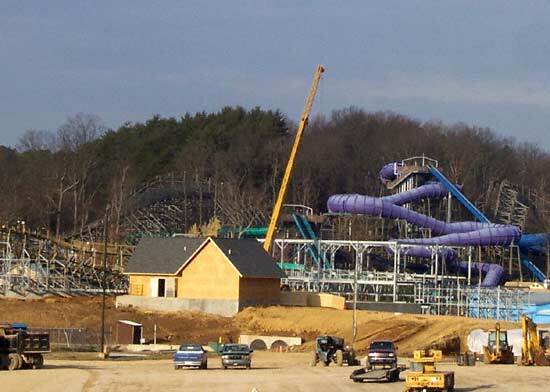 First off there has been a lot of clearing going on down next to the lift hill. 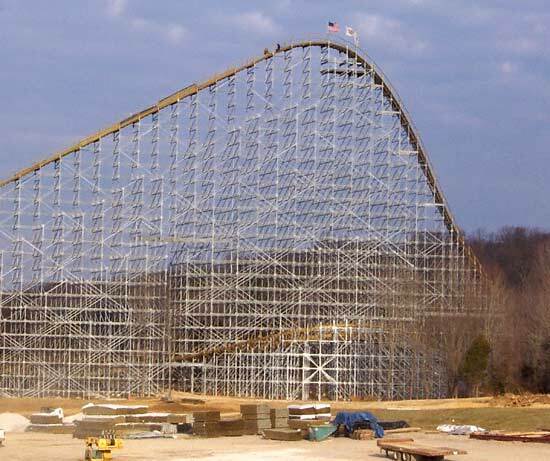 Last weekend you could only see half of The Voyage's final 90 degree banked turn and now you can see almost all of it. 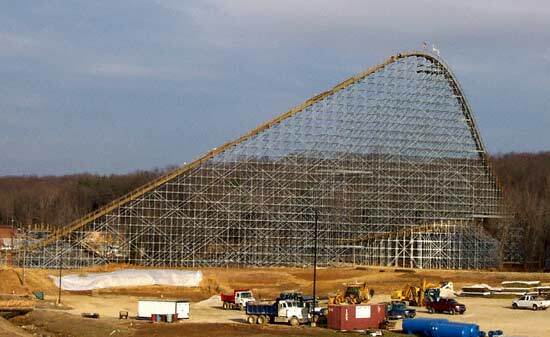 Also you'll notice several stacks of wood up on the lift hill and a few people busy tracking it. 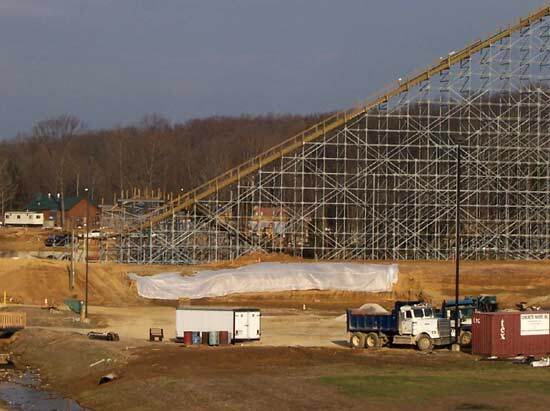 Here's a little wider view of the lift hill and the space that has been cleared this week. 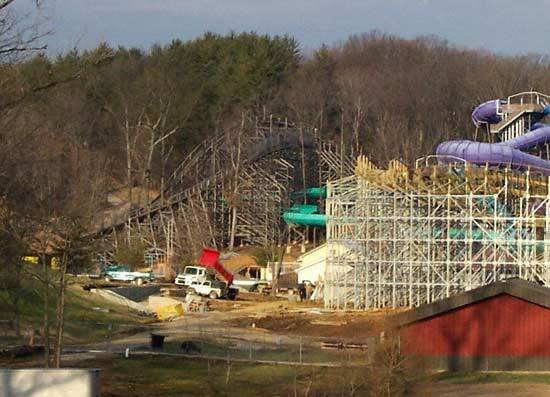 From what I hear things are really going to be popping up pretty quick including the Plymouth Rock Diner and the Gobbler's Getaway dark ride. Late in the week I noticed a truck backed up between the Pepsi Oasis and The Voyage's station dropping off that pile of wood roof trusses. So my guess is that they are for The Voyage's station which would explain the crane in the area. Maybe we'll see a roof on The Voyage's station this week? I was trying to figure out why they covered up this embankment but with a whole bunch of rain headed our way over the next couple of days I guess they don't want it all to get washed away. Also it is hard to see but behind The Voyage work continues on Bahari Action River. While I was walking around taking pictures I watched them work around the bridge that is going to take people down into the new Thanksgiving section. I can't wait to walk down that hill and have The Voyage fill the entire view in front of me. 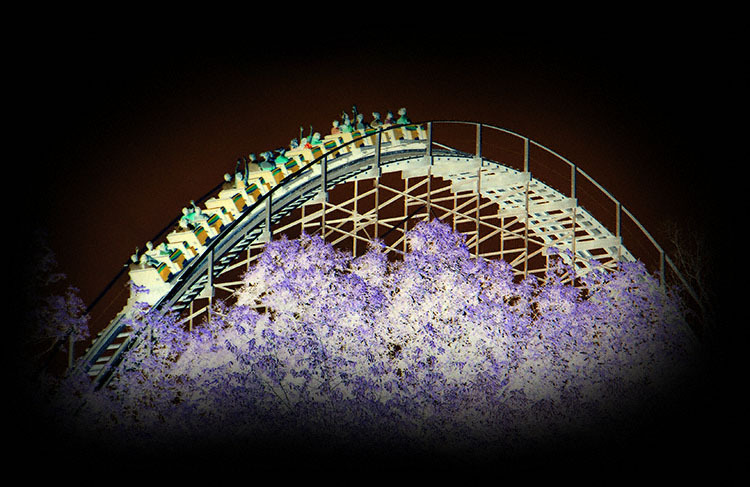 It's going to be wonderful heading through the coaster structure into Thanksgiving. In addition to what work you see here the second crane has been up in the woods by the "snowy white road" and from the looks of it has been working on structure back there. I'd grab a few photos of that but from the road through the trees not much shows up.